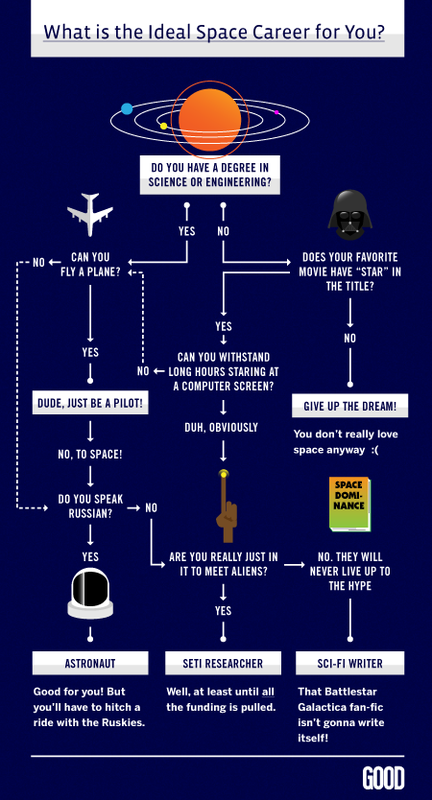 A few weeks ago, GOOD Magazine published a very entertaining infographic titled "Should You Give Up Your Dream of Being an Astronaut?" in response to a USA Today article interviewing Duane Ross on the changing prospects for NASA astronauts. I really like how well they were able to lightheartedly boil down some rather complex career decision factors into such simple binary choices. The main criticism I have for the flowchart is that it assumes the only way to be an astronaut is through NASA. It ignores the commercial pathways to space. For example, one can go into space and technically be an astronaut without having a science or engineering degree as long as one can afford the ticket as a private spaceflight participant. Assuming the chart is targeted towards prospective professional astronauts only rather than tourists, perhaps after the "Do you speak Russian?" question's "No" choice, there should have been another question like "Are you a trained commercial astronaut?" In other words, can you fly on commercial space vehicles? That gives you another pathway towards becoming an astronaut that is not reliant upon Russia or NASA. Only two weeks from now, I will undergo the NASTAR Suborbital Scientist Training Program to help prepare me for upcoming commercial spaceflight opportunities. Please consider chipping in to help offset my expenses, and stay tuned to this blog for updates on the experience. Paying for a seat does not a career astronaut make. The question is can you be an astronaut given your experience and future experience choices? I followed the flow chart, having multiple degrees in science, a commercial pilot’s license and yes, I even speak Russian. Not all flow charts work as I never even got an interview.